Photo by Michael Goldrei from the Londonist Flickr pool. 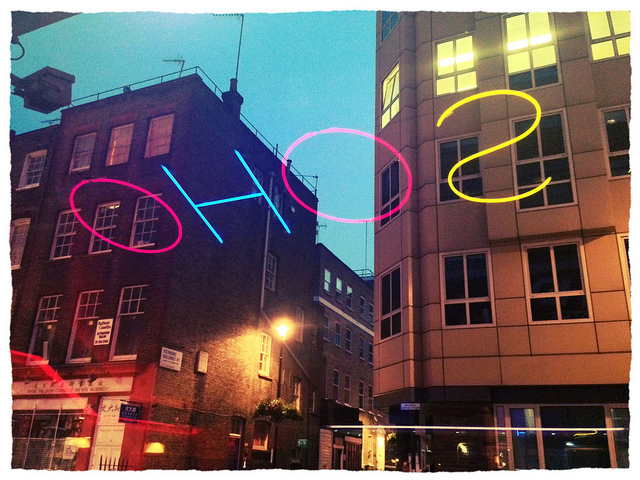 Soho is about half a dozen different districts superimposed one on top of the other: from lairy gaytopia to the old red light district, and the darkened termite mound of the film industry to the ersatz development zone some are intent on polishing it into. And it’s the discomfort of these identities rubbing up against each other that makes the place interesting, hence it’s the ideal place for people to come and pontificate about what they think creativity is and how it comes to pass. Next week, the area plays host to SohoCreate, a festival that will see a gaggle of filmmakers, foodies, designers and the like, locking antlers as they try to figure out who’s the most creative. Should be fun watching them. The line-up includes stroppy filmmaker Mike Figgis facing-off with art-provocateur Jake Chapman, or Reece Shearsmith and playwright Richard Bean, who’ll be trying to out-northern each other as they talk about coming to London from Hull. Other speakers include actors Jessica Hynes and Stephen Mangan, new director of the National Theatre Rufus Norris, rappers Ms Dynamite and Speech DeBelle, comedians Alexei Sayle and Sara Pascoe, the Royal Court’s Vicky Featherstone, chef Angela Hartnett, architect Will Alsop and film director Sir Alan Parker. There’ll also be open houses across the week with some cool places throwing their doors open including private members clubs, film production studios and art galleries. SohoCreate runs from 3-7 June. Tickets are £20 per event with three sessions for £50 (you can get a full festival pass for £240 which gets you into the Groucho Club for the week too).